Short-track speedskater Charles Hamelin is a favourite to win several medals for Canada at the 2010 Olympics in Vancouver. Short-track speedskater Charles Hamelin is a favourite to win several medals for Canada at the 2010 Olympics in Vancouver. But he wouldn't even be skating if his younger brother Francois hadn't been such an enthusiastic speedskater as a child. "I got to skate with Francois' club at Christmas and on other holidays and it was a lot of fun and I really liked the thrill of the ice," Charles said. "It was like a family event every time we went to the rink, everyone would pile into the car and it was just about having fun and skating fast and doing the best we could." Francois had been speedskating for a year when his brothers Mathieu and Charles joined him at the club in their hometown of Sainte-Julie, Que. Their father Yves had been coaching them in baseball and was asked to lend a hand on the ice. The family had been introduced to speedskating when Francois decided to take it up as an extra-curricular activity. "I had a lot of energy and my mom wanted me to find a way to spend it outside the house so she asked me if I wanted to do a sport," said Francois, who won a bronze medal in the 500-metre at Marquette, Mich., in the final World Cup race of the season on Nov. 15. "There was a little lake beside our house, and I used to skate on it in hockey skates. "When my mom asked me about which sport I wanted to do, I saw speedskating in a book and asked if that was like what I did on the lake. She said, 'Yes,' and so that's what I decided to do." Charles, left, and his brother Francois have stuck with speedskating, progressing to the highest levels of competition. ((Jonathan Hayward/Canadian Press))Although Mathieu gave up the sport after a few years, Francois and Charles have stuck with speedskating, progressing to the highest levels of competition. Yves has stayed on as a coach, eventually becoming team leader of Canada's national squad. "They just moved from one step to another together, not knowing where it could take them," Yves said. "Being such a technical sport, I went for certification courses that the skating association offers and I've moved with the same rhythm that Charles and Francois have as skaters, moving up the ranks." Nearly 15 years later, the Hamelins have become the first family of Canadian speedskating. Charles developed faster, winning seven gold medals in team and individual disciplines at the world championships between 2005 and 2009. At the 2006 Olympic Games in Turin, Italy, he was a part of Canada's silver medal 5,000-metre relay team. Francois won silver medals in World Cup events in 2008 and 2009, and has continued to grow and develop his skill and technique on the ice. The Hamelins are not the only athletes in the family. Their mother Manon Goulet is the cousin of former NHL star Michel Goulet, who played for the Quebec Nordiques and Chicago Blackhawks. This 2009 world championship season has been an eventful one for the Hamelin men. Given Charles's dominance in so many short-track speedskating disciplines, there stands a good chance he will be one of Canada's most decorated Olympic athletes. 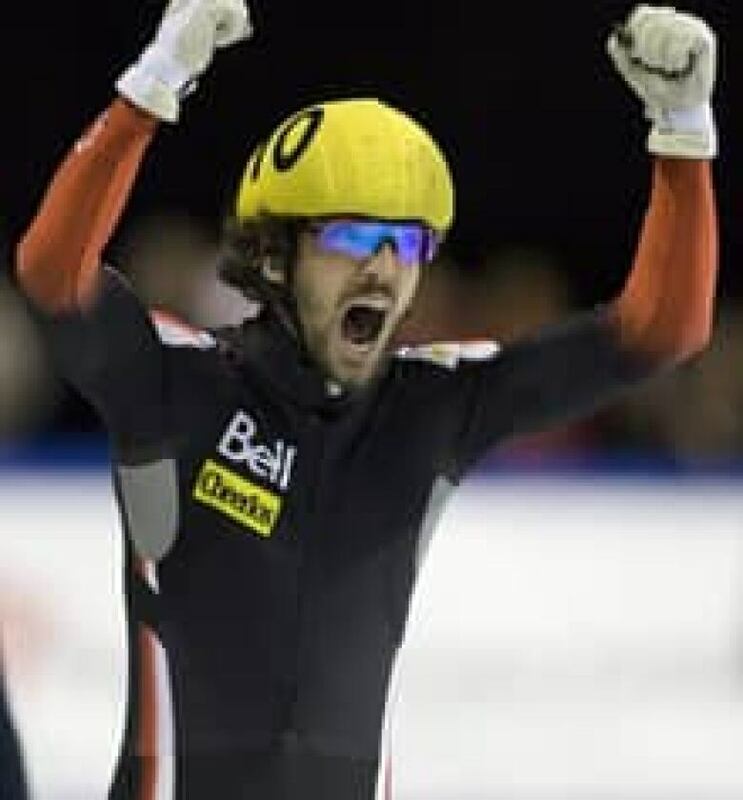 ((Jonathan Hayward/Canadian Press))Charles has been dominant all year, earning an early Olympic berth March 8 after winning the gold in the 500 and a bronze in the 3,000 super final at the short-track speedskating world championships in Vienna, Austria. These will be his second Olympic Games and he hopes to add individual success to his accomplishments with the relay team in Turin. However, the most dramatic moment of Charles' season had little to do with crossing the finish line. On Nov. 15, during a World Cup 1,000-metre qualifying heat at Marquette, Mich., two skaters ahead of Charles attempted a pass at the same time and ended up tangled on the ice. Unable to avoid the bodies ahead of him, Charles crashed into the boards, hitting his head and getting cut by his rivals' flying skates. It was one of the most serious accidents of his career. After the crash, Charles was held out of the rest of the races as a precautionary measure. "I think we made the right decision during the competition to pull me out of the races after the fall," Charles said. "It will let me focus on training with the team, instead of sitting out practice time with headaches." Charles has since returned to the ice and is on schedule for participating at Vancouver. Francois has come to accept that crashes are a part of racing. ((Jonathan Hayward/Canadian Press))The Hamelins have come to accept crashes as a part of racing, but they hope to see new, safer mats and boards installed around many of the ovals they compete in. "We fall pretty often. There's always that risk, particularly in the 500-metre when we're going around the corners in the later, faster laps," Francois said. "It can happen three times in a weekend or you can stay on your feet for years." At the same event that Charles fell, Francois came into his own as a skater. He earned a bronze medal in the 1,000 and a gold medal in the 5,000 relay. The third place World Cup finish was particularly exciting for Francois who was competing against some of the world's top short-track speedskaters. He kept pace with American Apolo Anton Ohno and Korean Lee Jung-Su. Entering the final laps of the race, Francois held on to third place, knowing that a podium finish would earn him a ticket to the Olympics. Charles's Olympic prospects are even more exciting. Fully recovered from his head injury, he is primed to take on the world. He is expected to win medals in several events including the 500, the 1,000, the 1,500 and also as the anchor of Canada's 5,000 relay team. Given Charles's dominance in so many speedskating disciplines, there stands a good chance that he will be one of Canada's most decorated athletes at Vancouver, and finish the Games with a handful of medals. "It is the greatest feeling I've ever had in my life," Charles said. "To have a chance to race at the Olympics is a big achievement, but to be able to do it at home in front of my family, my friends and my crowd, it will be incredible."